We've talked about the dearth of Vietnamese recipes on this blog before (in our Vietnamese Chicken Cabbage Salad on Sesame Rice Cracker post) as a situation we need to rectify. We love Vietnamese food: we should be making more Vietnamese food at home. 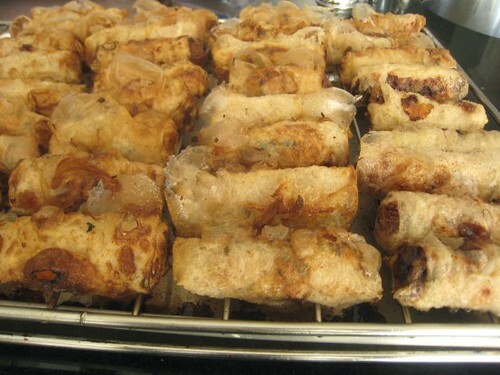 Of course, one of my favourite things to eat at Vietnamese restaurants is cha gio (Vietnamese spring rolls). As usual, we start off with a lot of ground pork, about 3 pounds' worth. It's because I had three pounds of ground pork in the fridge that day and I wasn't sure what to do with the leftover pork had we decided to make a smaller batch of cha gio. Besides, I thought -- cha gio? I mean, surely the more we have, the better it is! After all, we can't seem to control ourselves when it comes to food. 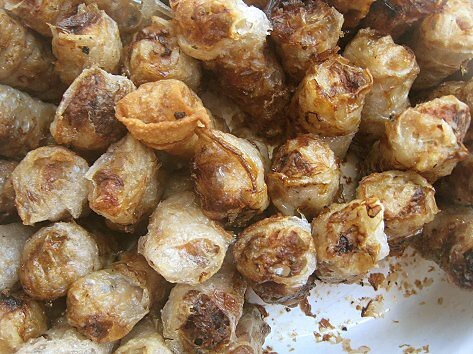 What goes into the cha gio filling? 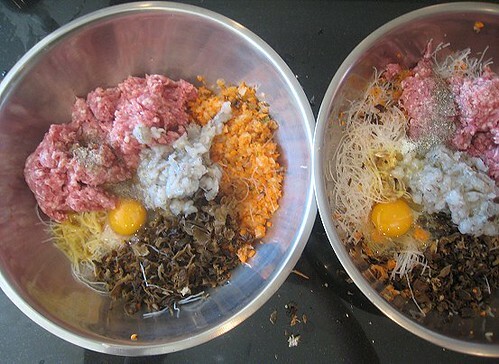 There's ground pork, ground shrimp, bean thread noodles, onions, carrots, eggs for binding, then salt, sugar, black pepper and fish sauce for seasoning. There's also tree ear fungus! 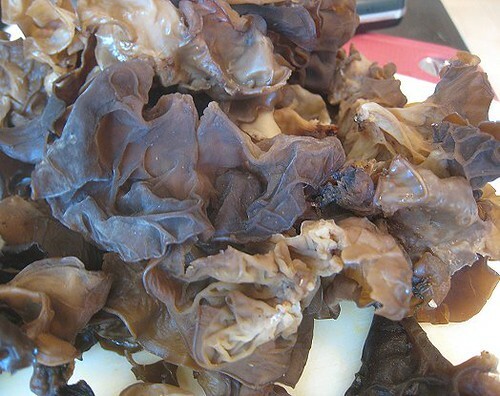 OK, anytime you hear "fungus", it's not that appealing. So I'll rephrase: there's also tree ear mushrooms! Aren't they pretty? I love tree ear fungus mushrooms. Having the pork poundage in my head and having accepted it as a theoretical proposition, I was quite surprised when I saw how much it actually was! When you add up all the other ingredients, it seemed like my pork has doubled in volume. Let us remind you of the volume we're dealing with. These are two large bowls of filling! I was thinking about to the massive fry job this will entail and I was silently berating myself for being so gung-ho about the cha gio. I had some rice paper in the pantry and was excited that we were finally going to use it. I've never worked with rice paper before, but I do prefer rice-paper-cha-gio over the spring-roll-wrapper-cha-gios. Well, after this whole exercise is done, it turns out I still would have not worked with rice paper, as TS had to do the whole wrapping on her own. I took one look at how she wrapped the first one and decided that I, with my less than dexterous fingers, most likely wouldn't make the grade in cha gio wrapping. I had a feeling mine would be all askew and loose -- and while askew might be acceptable, loose is not good. My wrapping skills were not really up to par as well, but as is always in our case, I deemed it "good enough". Of course, that didn't stop JS and CSC from "back-seat-wrapping" for me. They would call out instructions like, "Make it tighter!" Or, "Put more filling!" Or, "It's too small!" Yes, I tried to make my cha gio demure in size, but JS and CSC kept pushing me to put more and more filling in, despite the disastrous consequences that may ensue. 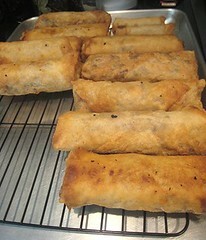 I let TS do all the wrapping -- CSC helped too -- because after all, I had another task to handle, namely, frying up the cha gio as soon as TS finished rolling them. I devised a plan to handle the seemingly millions of cha gio rolling out of their hands. I figured I'd do a fry-then-bake job as something more safe and something that would save me a bit of time. The plan was to have the rice paper wrapper to come into contact with hot oil for a time, until it's nice, golden, and bubbly, and then it's off to the oven to finish cooking. Of course, in our haste and laziness, our cha gio would be rejected from any cha gio beauty contest. Just look at their grotesque selves above! I don't know if my method actually saved me time, but it just felt like a saner approach than standing and waiting for each cha gio to finish cooking in the oil. In our defense, look at the number of cha gio we had to fry up! 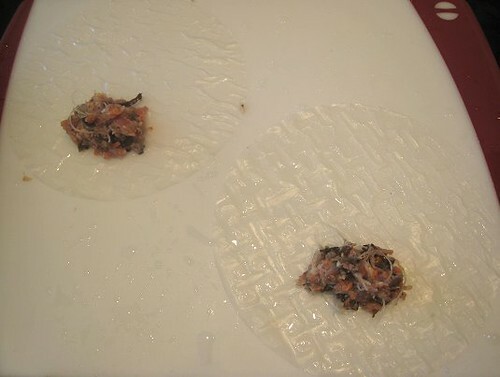 We actually had so much filling that we finished two packs of rice paper. 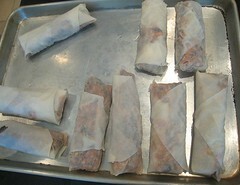 Luckily, we happened to have some leftover spring roll wrappers in the fridge, so I set about rolling those too. This time, I fulfilled the fantasy shared by JS and CSC of humongo "cha gio", making these ones very large indeed. 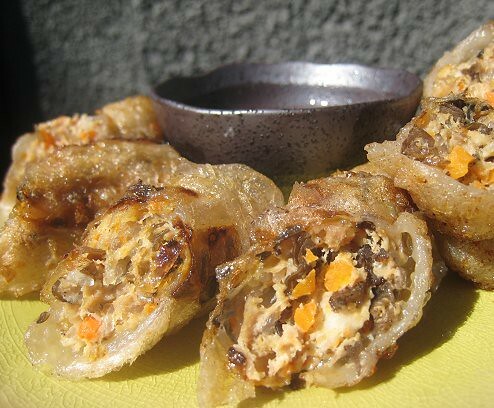 Even with the humongo spring rolls, we still had some leftover filling. So, as you can see above, we just made plain ol' meatballs out of them. 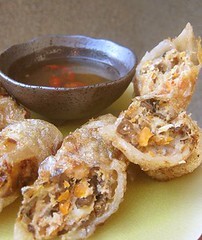 We made nuoc cham (or more specifically, nuoc mam cham ngot) to serve with these rolls. That's a sauce made with fish sauce, water, sugar and vinegar. Despite our execution issues, these cha gio were so good! We took the suggestion by Wandering Chopsticks to eat them in the manner of the Southern Vietnamese by wrapping them inside lettuce leaves with some herbs. I definitely prefer them this way now! 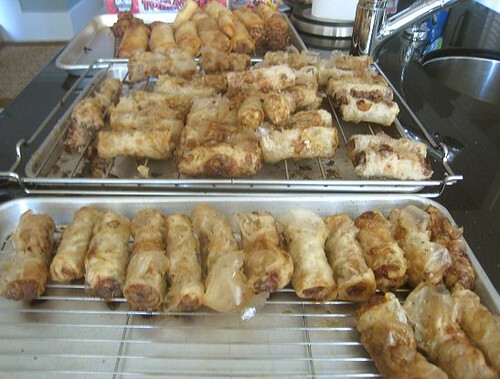 In case anyone was wondering about the caption below the first photo, one of these rolls have a spring roll wrapper while the rest are wrapped with rice paper. Can you spot the spring roll wrapper one? Of course, where else would we have gotten the recipes but at Wandering Chopsticks. She has not one, but two, cha gio posts. 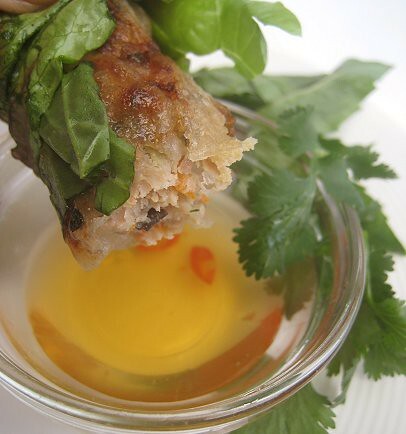 You may also want to make some Nuoc Mam Cham (Vietnamese Fish Dipping Sauce). 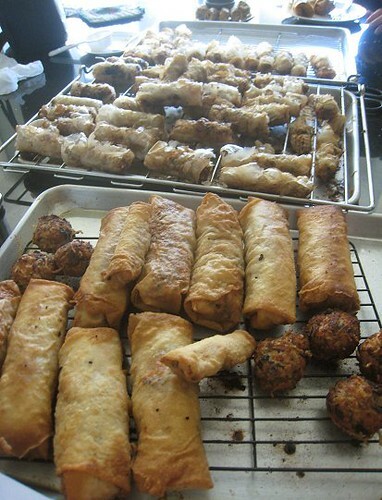 We're submitting this to Regional Recipes, a blogging event created by Darlene of Blazing Hot Wok that celebrates food from all over the world. The torch has since been passed to Joanne of Eats Well with Others. Hi TS and JS, this looks fabulous! 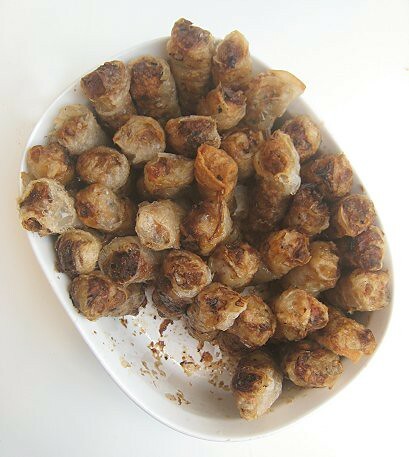 The nuoc cham really makes or breaks Vietnamese spring rolls (for me anyway), so good on you gals for making that as well! BTW, you can also just freeze the filling for when you have a craving. I just save them in sandwich bags, which makes just enough for the occasionally craving. Or add some egg and steam them and make a Vietnamese steamed meatloaf to eat with rice. 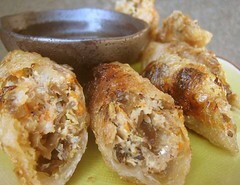 I love vietnamese spring rolls sliced & serve over a noodle salad with the dipping sauce as dressing yum! I know it was a lot of work! but look at the result! Love those bubbles! I am drooling, I should make some too! I have only made the cold version but not the fried version because I do not so much frying at home. and if I do, would be better to do a big batch like you did. Fabulous post! I love them wrapped in lettuce leaves also. I never made them. There is a place at the corner of E. Hastings and Heatley? next to a Karate store, that sells them in bulk. Already fried. I go there for my fix. 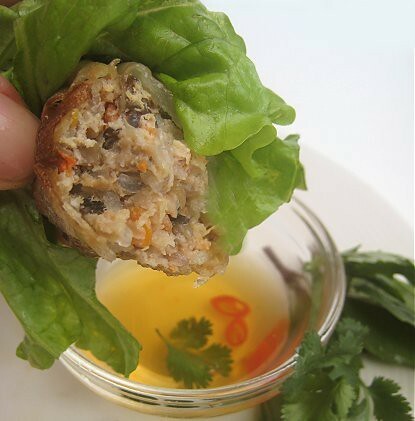 Mmm I love the idea of eating the spring rolls inside lettuce! Never thought of that before but it would help offset the deep friedness. Yeah, I find that the nuoc cham really helps cut the "fried" flavor... and the lettuce was also very refreshing! Haha. Well, 6 adults + 3 children. Also, one mustn't forget that we are ALL gluttons! Seriously. We always look forward to entering something for Regional Recipes. Good thing we were able to this time. 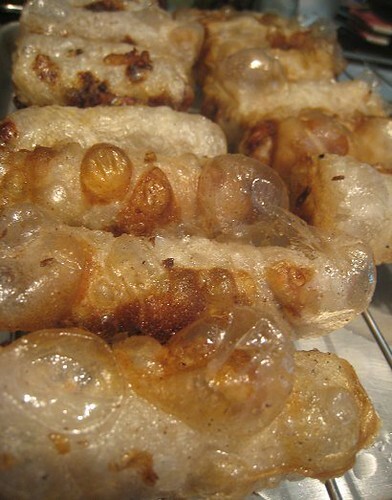 We haven't actually tried making Vietnamese bun yet... but you're right, pour on that nuoc cham and it's all good! Thanks! Although, I think the bubbles mean we did a bad fry job. Hehe. Oh, really? I think I've seen the karate store... if you mean East Hasting and near Nanaimo St... OK, will have to check that place out!